1)What's the difference between the leaked screener and the actual release, I heard something about CGI effects, but what are these? I was wondering if i could just download the screener since there is no other way to watch it from here, the DVD won't come out for a damn long time. 2) Will there be any extra scenes in the actual release that are not in the screener? Because if so, I might as well wait so at least I get the story when I watch. Anyone who's got anything to say about RAZOR can post here, BUT MAKE SURE TO TAG YOUR SPOILERS PROPERLY! I don't wan't to know what happens till I watch even if it is 6 weeks from now! Thanks in advance guys. Theres no need for spoiler tags for those questions. The screener and the one that airs should be exactly the same, but the DVD version will have extra scenes in it, this has already been said several times. The screener's effects quality might be a little lower, but all the scenes should be the same. I can't wait for the DVD release. old style raider was officially in a new Battlestar Galactica episode. so it now HAS to be part of BTRL somehow lol. 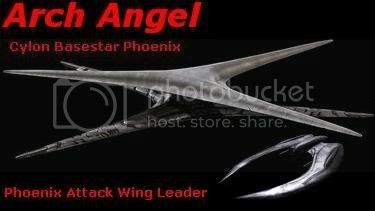 it was used in the Battlestar Galactica RAZOR 2 hour movie. so since it was officially used we somehow have to work it into BTRL lol. whether as an officially added ship or as a custom added download. it HAS to be there now to keep in line with using official ships that were used in the new Battlestar Galactica series. by the way the RAZOR movie was AWESOME. Added a spoiler tag. Feel free to talk about it as much as you like on this thread now. And yes, the voice of the Hybrid is the same guy who did the voice of the Bentuzi in Homeworld. As for the old Raider I may only be one of the voters on the team but I was always in favour of having it. Razor just means I'm much more likely to get it quickly. I dug Razor for the most part. I thought the actress that played Shaw was a little weak compared to the rest of the cast... her delivery was flat even when she was a "scared rook". I can understand later as she's supposed to be hardened... but even then it felt like there was no force behind the words. Effects were great... "By your command" was sweet. My only other gripe is that the hallway shoot out felt WAY too much like Aliens. Even the rifle sounds were the same. Now I love Aliens... as Aliens. I think that could have been done better. Still love/hate Cain and Forbes was great reprising her role. I wish they'd have made the XO execution hit home a little harder. That it was her friend she'd known for years that she's just offed. I really thought Katee Sackhoff was excellent in this too, unlike the later parts of season 3. Super cool seeing the old Pegasus cast back in all its glory... from Showboat to Hoshi to Fisk to Laird. Word. So THAT'S where I knew that voice from. It's been so long since I've played it I couldn't place it. I was impressed by the was they CGIed the first gen Cylons. When I first saw them in the Raider I thought they'd look all chunky like back in TOS Galactica, when they still had to use real people for the centurions. I'm still trying to decide whether or not I like the idea of Cain being in a relationship with a 6 though. Certainly gives substance to why she was being so cruel, but it just has been done with the Baltar relationship. Wait a minute.... what am I saying???!!!??? Now I know what "RAZOR" means. It seems that I married one. Razor strikes me as being "fan candy". It jumped around too much, IMHO, and relied on a character that I didn't connect with - though I think that's because she didn't have a lot of backstory presented anyway. Overall, it felt like a lot of cool moments that they wanted to put in the series, but wouldn't have made chronological sense. The other thing I didn't like was that they used the traditional BSG credits/recounting style. The previews, in particular, seemed to needlessly chop up the pacing. Does anyone think that the hybrid's conversation with shaw just before she sets off the nuke, is a major clue to the fifth Cylon? We've already seen in season 4 trailers that there is much debate about starbucks return... I think it's more to create controversy amongst the fan base, considering no one else in universe heard it. Though I've no idea how the hell the fleet will get out of the situation they're in at the end of season 3... Deus ex Machina, anyone? That's similar to the way RDM put it IIRC. He said that he noticed after the end of season 3 that a portion of the story hadn't been told and that he could go back and flesh it out. I wish they'd have made the XO execution hit home a little harder. That it was her friend she'd known for years that she's just offed. I think the problem was him looking too much like Joey Tribbiani, haircut and goofy grin and everything. Can anyone tell me how long it was? I've heard people saying it wasn't 2 hour as stated on wikipedia. A little under 1 and a half hours, so it would be about 2 hours on TV (With ads).